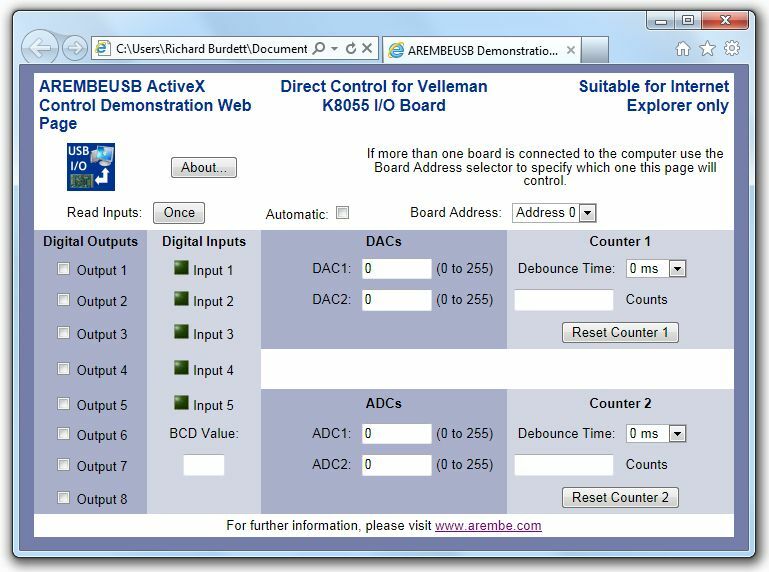 The AREMBEUSB ActiveX Control and Software Development Kit (SDK) is designed to allow up to four Velleman K8055/K8055N/VM110/VM110N USB Experiment Interface Boards to be controlled from a PC computer. 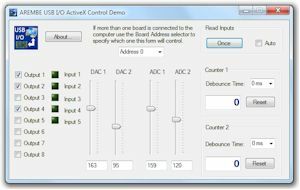 It offers an alternative to the software supplied by Velleman with the boards and makes it easier to incorporate control for them into programs written in many different languages. The control is supplied with several different examples showing how to use it in C# and Visual Basic for Visual Studio 2010, C++ for Visual Studio 6.0, HTML with JScript, Excel using VBA, and LabVIEW, any of which may be used as the basis for further development. 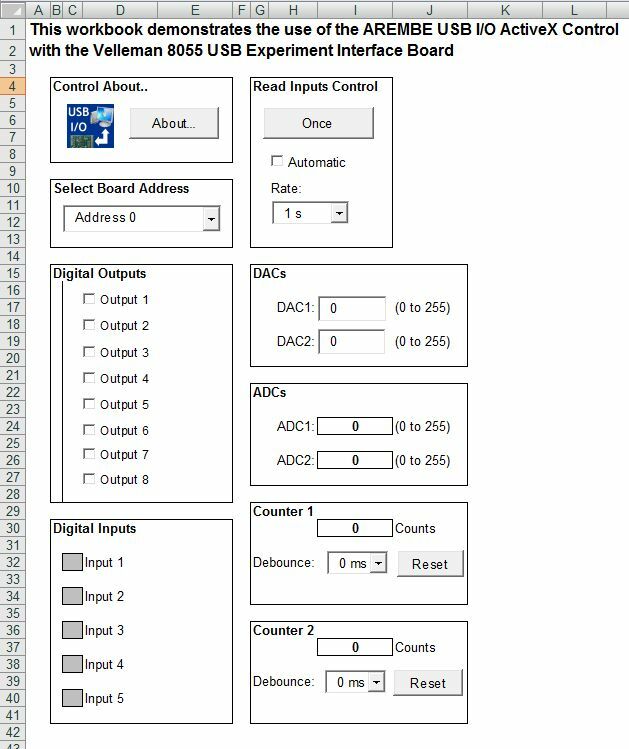 The AREMBEUSB ActiveX control allows the status of the digital inputs, ADC values, and counter values to be read; the counter debounce times to be set and the counters reset, and the digital outputs and DAC values to be set. 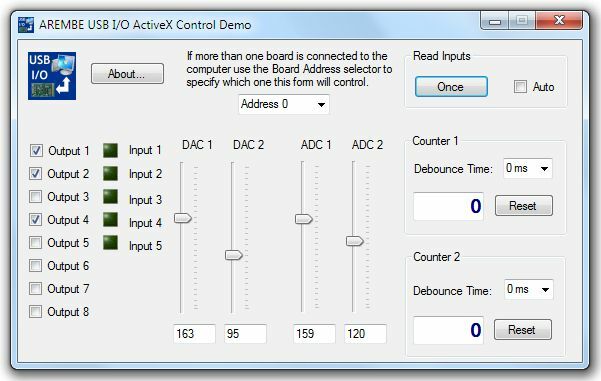 In addition the control can be set to display warning dialogs when a board is connected or disconnected, and/or notify these events to the containing program. 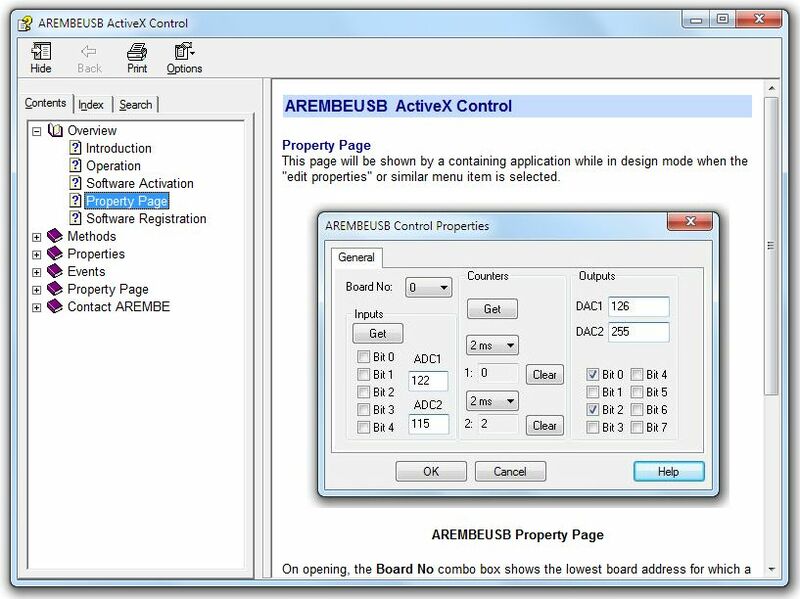 The AREMBEUSB ActiveX control has been verified as operating correctly on computers running Windows XP SP3 32 bit, Windows Vista 32 bit, and Windows 7 (both 32 and 64 bit versions). 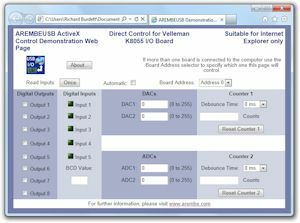 No special device drivers or DLL's are needed to use it, and operation does not rely on any of the software supplied by Velleman (although this can also be installed and used, though obviously not at the same time as the AREMBEUSB control, without problem). In order to modify the demonstration programs the computer must also have the relevant development environment, e.g. 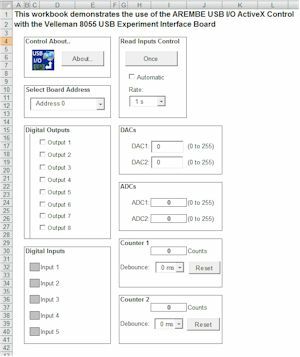 to use the LabVIEW driver LabVIEW must be installed on the PC. However, the HTML web page example can be run on any computer that has Internet Explorer installed, and since it is a simple HTML text file, can be edited using any text editor, such as Notepad, that is part of a standard Windows installation. 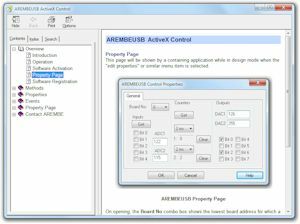 Try before you Buy - Download AREMBEUSB Today! The software can be downloaded without charge by clicking the link below or on the left. When installed, it operates in a demonstration mode, which is fully functional except that the number of data transfers from the PC to the board is limited for each session in which the software is used. Once you are happy that it meets your needs you can purchase an activation code by clicking the link in the software, or on the left sidebar on this page.